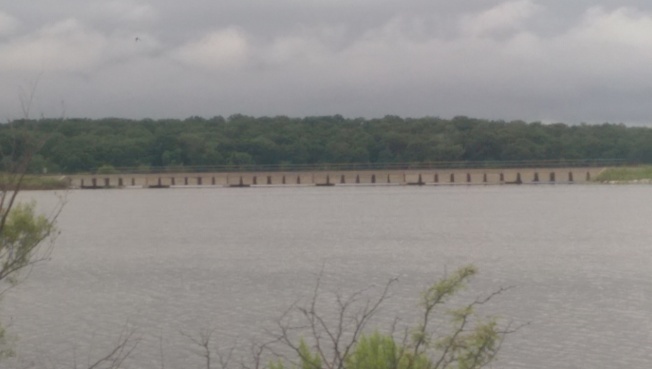 Lake Ray Roberts Lake Ray Roberts at Buck Creek branch off Hwy 377 in Tioga (Ti-o-ga not Tee-o-ga) possibly soon to be shut down due to water going over highway. Almost up to railroad bridge and still rising. Hundreds of volunteers have helped restore more than 50 Texas state parks damaged or closed following deadly Memorial Day weekend flooding. The Texas Parks & Wildlife Department says four parks remain closed going into Labor Day weekend. They are Cedar Hill State Park, Lake Somerville State Park, Lake Whitney State Park and Ray Roberts Lake State Park. Agency executive Brent Leisure said Thursday that parks must be safe for public use before the sites reopen. Officials say the most expensive infrastructure damage happened at Bastrop State Park, 30 miles east of Austin, with the loss of the lake dam. A section of main park road was washed away. Reconstruction costs are estimated at $6 million. Memorial Day weekend flooding in Texas claimed more than two dozen lives.